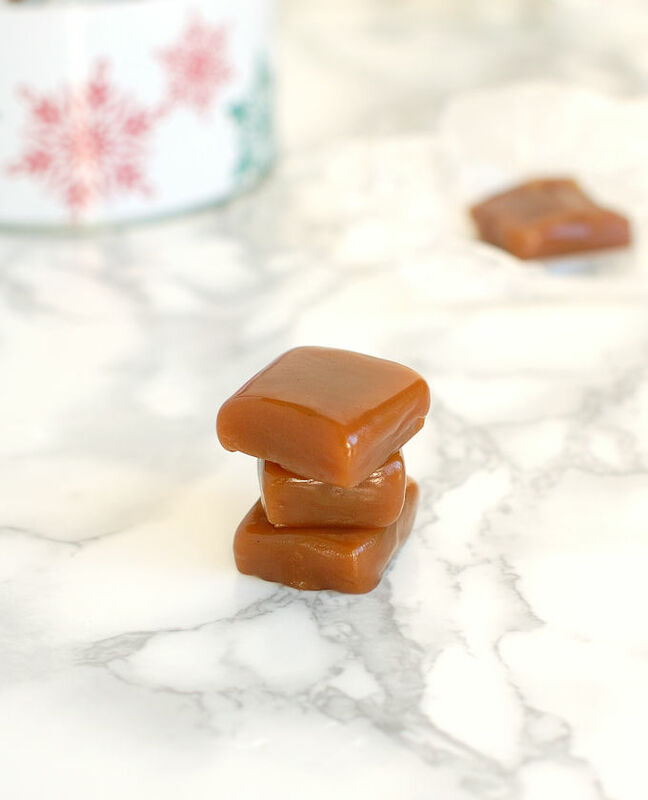 Apple Cider Caramels – Homemade Candy! 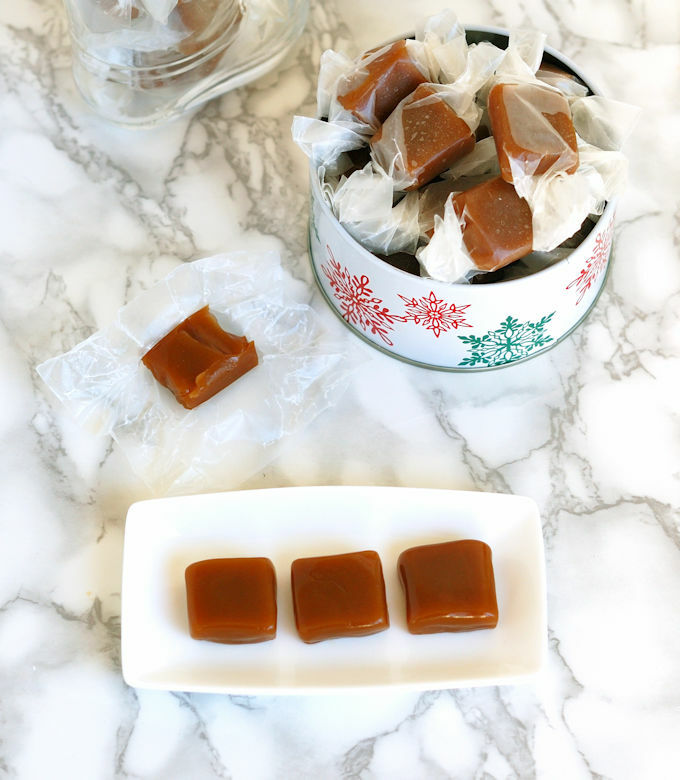 Apple Cider Caramels have a wonderful, apple-pie flavor. Reduced apple cider adds a background tang that goes perfectly with cinnamon and ginger. 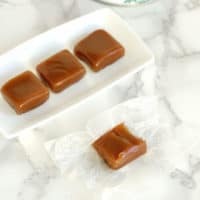 With just a touch of salt to bring out the other flavors, Apple Cider Caramels are a nice change from the ubiquitous salted caramels! 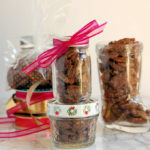 For the holidays I always make little treats which I can package-up as small gifts for family, friends, hostesses, etc. A couple of years ago I created Shortbread Gift Boxes that were a big hit. 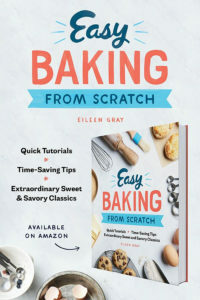 Last year I filled gift bags with Cherry Almond Scone Mix –just add water to make warm, fresh-baked scones! 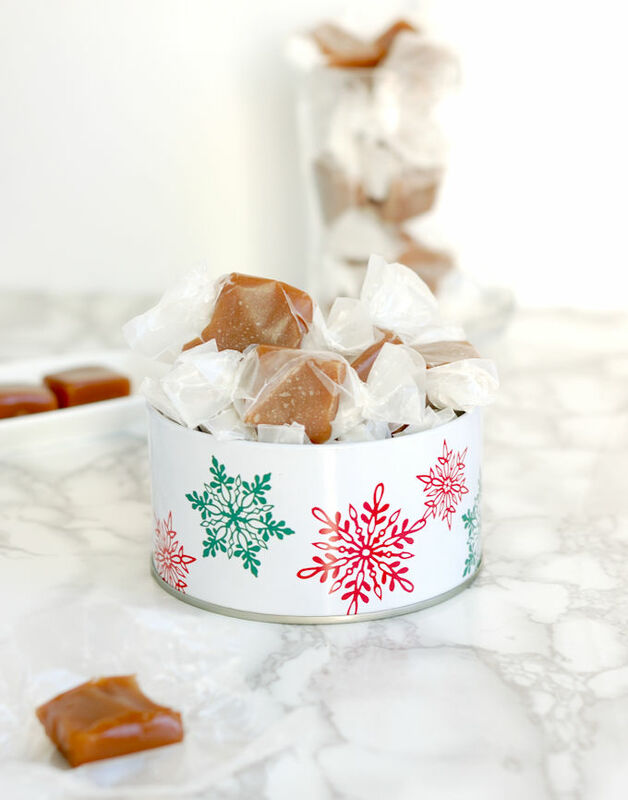 This year’s package will include these delicious Apple Cider Caramels. 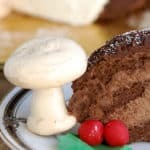 This recipe was inspired by an article I read in Sift Magazine. 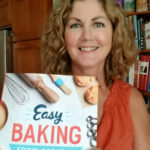 Sift is a magazine published by the folks at King Arthur Flour. I adore their products, their website and their magazine. The story that inspired this recipe was about a family in Vermont that makes old-fashioned “boiled cider”. Despite the fact that we visit Vermont a couple of times every winter, and our daughter went to college in the state, I’d never heard of boiled cider before. But I have been using reduced apple cider in my own kitchen forever. Whenever we have apple cider left over, I cook it to a concentrated syrup and freeze it. Reduced cider gives you all the flavor of fresh apples, with very little added water. I use it in salad dressings, on pork chops and toss it with roasted winter veggies. But I hadn’t thought to use the reduced cider to make candies until I saw the recipe for Boiled Cider Caramels in Sift Magazine. With the original recipe as a starting point, I replaced the boiled cider with reduced Gold Rush Apple Cider. I also changed the spices a bit because I always want a little more ginger. The flavor of the first batch was A-MAZ-ING! But the caramels were very, very soft and a little pale. For the second batch I reduced the amount of cream and changed how the candy was cooked. The original recipe mixed all the ingredients together then cooked the mix to 248°F. 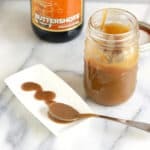 I wanted a deeper caramel color and firmer texture, so I decided to caramelized the sugar and corn syrup, then add the other ingredients and cook to 250°F. 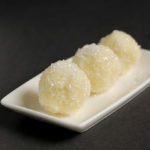 The candies from the second batch (seen in the photos and video) are firm enough to hold their shape, but still have a soft bite. They have a deep caramel color and flavor. Exactly what I was after. Since I wasn’t happy with the first batch I decided to run a little experiment (yay, we love kitchen experiments!). I put the soft caramel back into the pan, brought it up to a boil, and cooked it to 250°F. I was delighted and, frankly, surprised that the recooked candies didn’t get gritty or crystallized. They did set up quite firm. I think they probably went a bit over 250°F by the time the candy melted and came back to a boil. Still delicious, though. 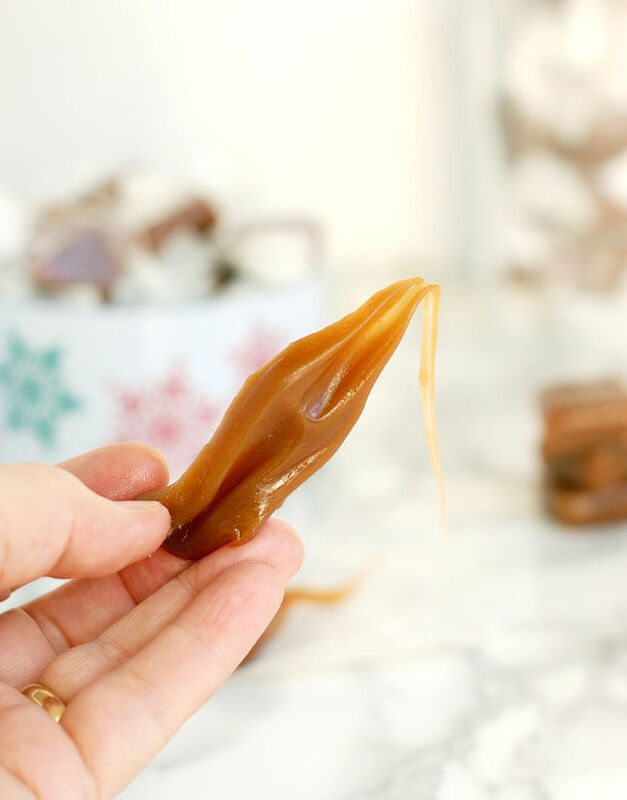 If you like softer caramels cook the candy to 248°, if you like them a little firmer cook to 250°F. But as you can see from my little experiment, this recipe is pretty forgiving. 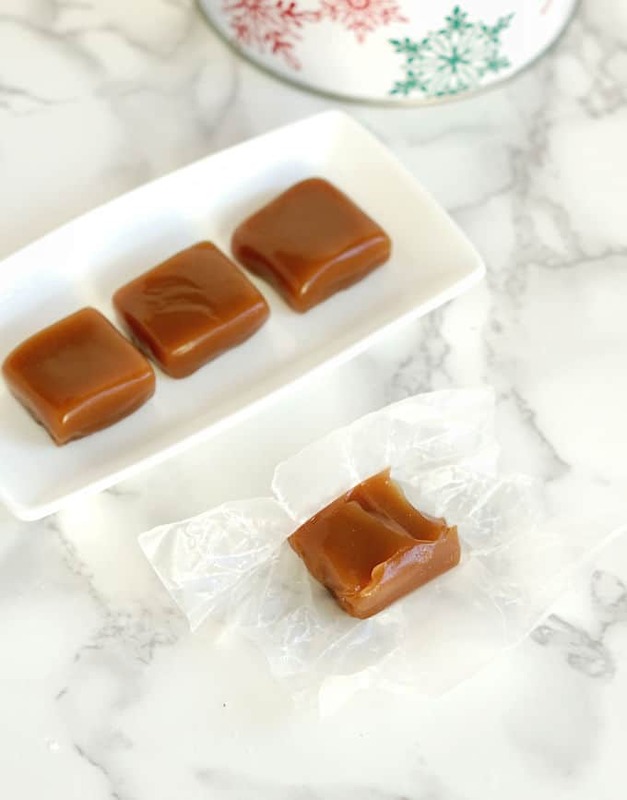 Watch the recipe video to see how to make Apple Cider Caramels. 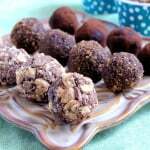 These candies are a perfect “Gift from the Kitchen”! 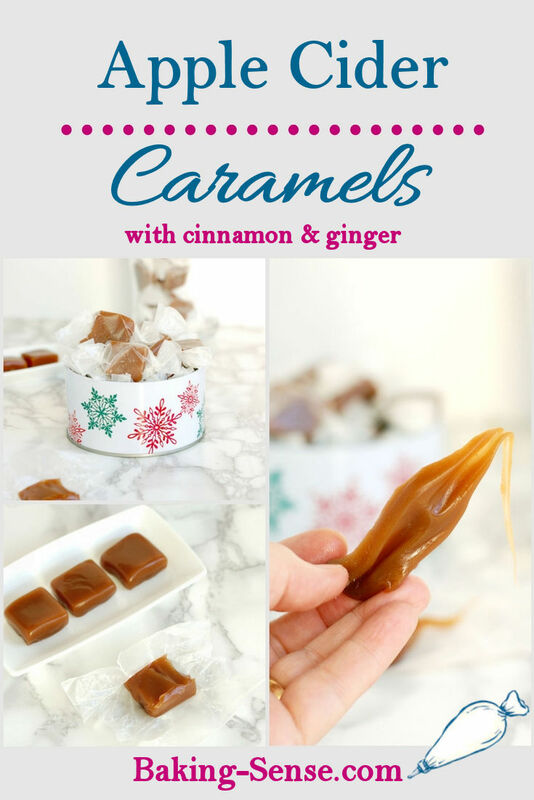 Caramel candies get a special flavor from apple cider and warm spices. They taste like apple pie! Butter an 8"x 8" square baking pan and line in both directions with parchment paper, also butter the parchment paper. Bring the cider to a boil over medium high heat and allow it to reduce by 3/4. You should have 1/2 cup when you're done. This should take about 15 minutes. Reduce the heat to low, then add the cream, butter and vanilla to the reduced cider. Cook until the butter is melted, then set the mixture aside. Combine the sugar and corn syrup in a large, heavy Dutch oven. 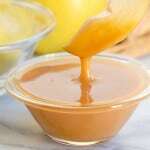 Heat over medium high heat until the sugar is melted and the mixture becomes a medium caramel color. Do not stir once the sugar is boiling. You can pick up the pot and swirl it around if you see dark spots in the caramel. Add the cider/cream mixture all at once. Keep your face away from the pan because the steam can burn. Stir with a silicone spatula to combine. Reduce heat to medium and cook until 248°-250°F, do not stir. Turn off the heat and whisk in the salt, cinnamon and ginger. Pour the caramel into the prepared pan and let set, uncovered, overnight at room temperature. Cut into 1" squares using a sharp, oiled knife. Wipe the blade between cuts with an oiled paper towel. Wrap the candies in squares of wax or parchment paper. Keep in an airtight container at room temperature. The candies will keep indefinitely in an air tight container. I would like to leave out the corn syrup, would I use an equal amount of white or brown sugar instead? Sorry for the delayed response. The corn syrup not only adds sweetness, it also prevents the sugar from crystallizing as it boils. If you replace the corn syrup with sugar you’d need something else to prevent crystallization. Lemon juice or cream of tarter also prevents the boiling syrup from forming crystals. I can’t say exactly how to make the replacement since I haven’t tried it. But I would start with a teaspoon of lemon juice and see how that works.